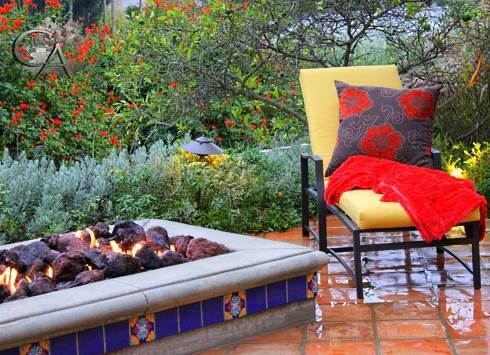 The fireplace tile designs featured here encompass a rich palette of colors, patterns and textures. 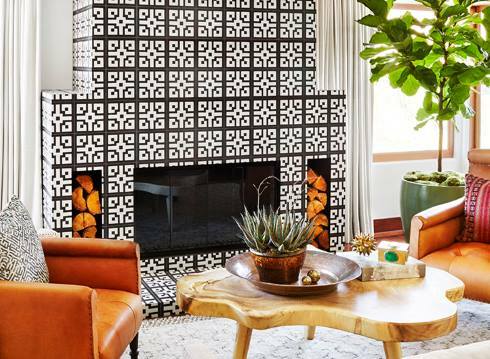 From vibrant Arts and Crafts compositions and bold contemporary schemes to intricate mosaic tile patterns, they make a unique design statement and engaging focal point in the rooms they adorn! 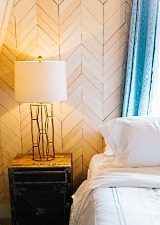 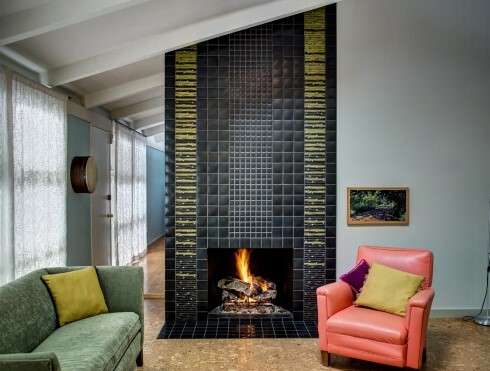 Boldly patterned tiles lend contemporary flair and panache to a bedroom fireplace in Los Angeles. 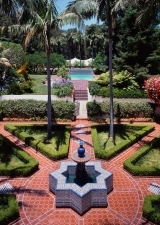 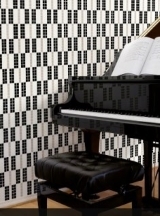 The striking black and white tile surround was designed by Mat Sanders of Domaine Home for actress Jessica Alba. 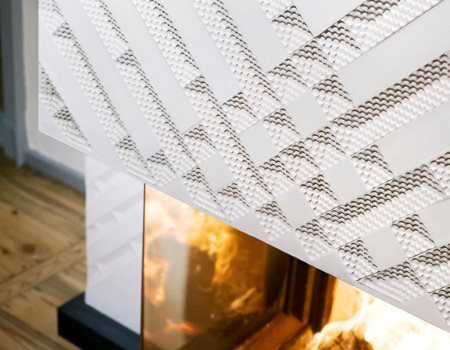 Past and present come together in a unique transitional fireplace design (below). 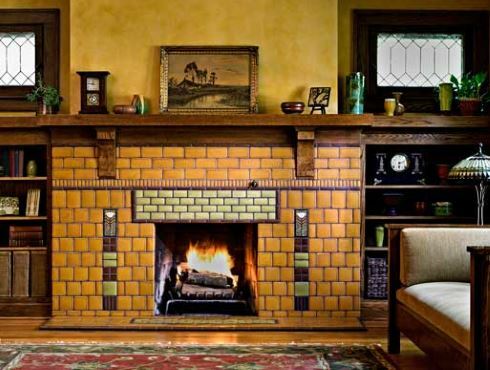 One of many finely crafted mosaic tile patterns from Mosaic Marble, the fireplace surround features a broad arched opening with contrasting curvilinear forms above, left, and right. 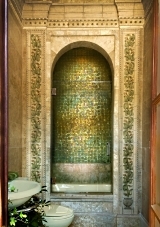 To say that Motawi Tileworks is passionate about tile would be a major understate- ment. 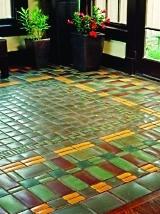 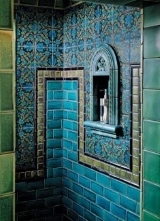 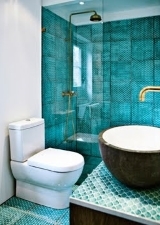 The Ann Arbor, Michigan-based firm conjures up beautiful tiles in the spirit of the Arts and Crafts Movement. 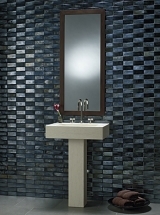 Motawi's distinctive look and outstanding quality raise the bar on ceramic tile art! 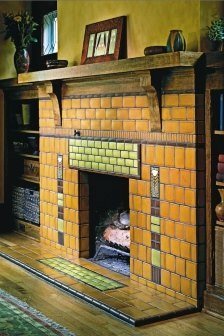 A running bond pattern of varying tile sizes and colors infuses the striking fireplace tile design below. 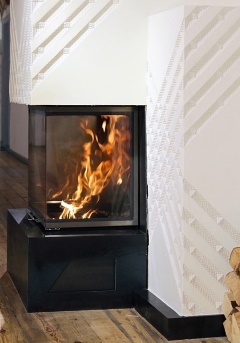 On each side of the firebox opening, a vertical "stripe" punctuates the horizontal orientation of the overall composition for added contrast and visual appeal. 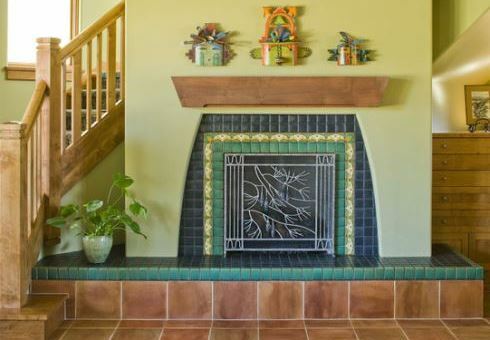 Southwestern detailing defines another tile fireplace surround from Motawi. 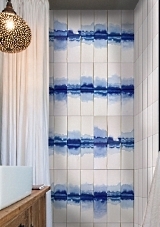 Milwau- kee-based architectural firm, Deep River Partners, created this beautiful design for a client in Arizona. 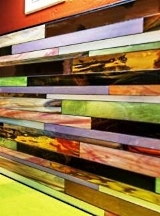 Motawi's Zelda series has a modern look in "a rippling cascade of hues punctuated with contrasting spots of color." 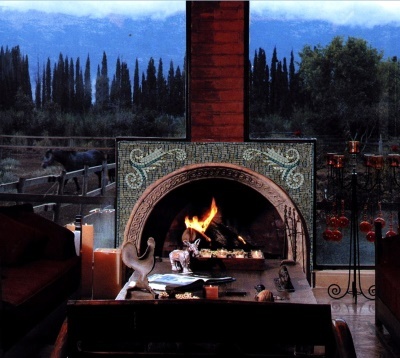 The soaring fireplace surround, below, features sixteen different versions of Zelda tile. 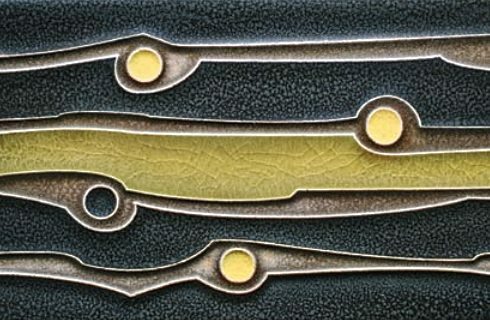 Zelda's rich variations in texture and color are clearly evident in the following close-up image, pictured in "Retro Lime." 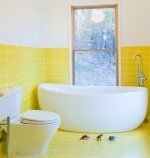 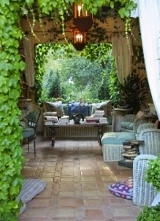 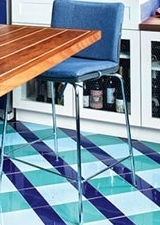 Floor Tile Design Ideas to Lift Your Soles! 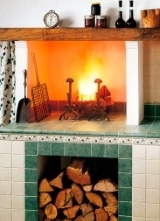 Hobbit Fireplace . 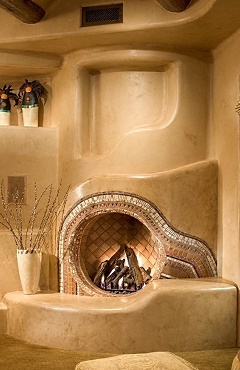 . .
A kiva-inspired fire surround (right and below) from Bess Jones Interiors makes a striking hobbit hearth in Arizona. 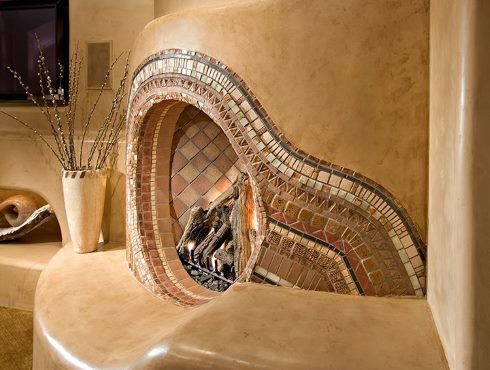 Intricate semicircular rings of tile frame the round firebox opening to give it a very distinctive look. 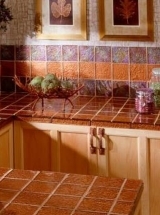 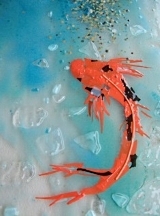 The decorative tilework was created by Scottsdale artist Joan Baron. 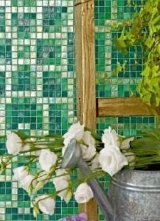 Please check back often or subscribe to our RSS feed, as we frequently add new fireplace tile designs to our site.